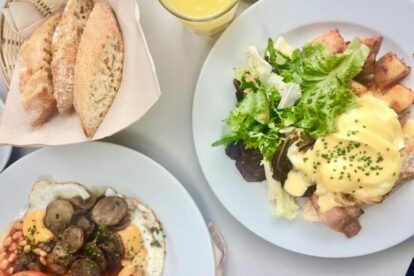 Passeig de San Joan is becoming the city’s foodie heaven with many great brunch places to choose from. Firebug is one of them! Located close to Arc de Triomf this is the perfect spot for a brunch before enjoying a walk down to my favourite park, Park Ciutadella. The bar has a cosy and bright interior with many windows that allows plenty of light inside during the day and at night gives you a nice view on the people walking by. It also has a huge terrace on the broad sidewalk where you can enjoy your brunch in the sun. I keep mentioning brunch as the Eggs Benedict they serve here are my absolute favourite in town! The portions are quite big and perfect for that weekend recovery! However, Firebug is not just a brunch bar. It’s also a great place to go to at night. Owned by the same people as Milk, you can expect the same quality of cocktails. Whether you prefer the classics, or rather try something new, the cocktail menu is extensive and delicious. (Try the Diavola!) The evening menu is very diverse and has a lot of dishes that are great for sharing. Perfect if you want to have some food on a friends night out.